I have pleasure in offering the following for your new proposed "
A glider fettler at the Club needed a protractor to measure a 30 degree angle and asked around various members only to be met by silence and a general shaking of heads until the resident grass cutter and flower arranger said "I have got a tractor, will that do? It's all a matter of degree! When is a retrieve crew not a retieve crew?? when they don't take the trailer with them. This one came about when Alan Wyse landed out successfully at RAF Marham with his 50km silver leg in the bag. The retrieve crew AG and BP left the site to go and pick him up but forget to pick up the trailer!!! Luckily they spotted there were not being followed by said trailer before they had gone too far and returned to the Club to pick up 870's trailer. Did they bring it back?????? well they brought something back!!!! Always fly in the middle of the sky. Most of the problems happen near the edges. A helicopter is a loose collection of 10,000 metal parts all fatigueing themselves at different rates around an oil leak. dear Mr web master, this is roger's grand daughter, daisy. we have been looking at the new web page and we think it is bestest we have ever seen (no joke). we hope that lots of your members will give you things to put in it. it would be nice if you had more younger people so I could play with them like Emma & Lille. X usually marks the spot but in this case??? Or is it a target to get rid of the WebMaster ??? 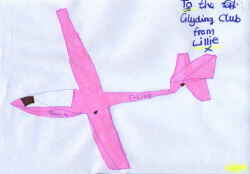 Some else suggested "Never argue with an idiot, you only lower yourself to their level and they have had years of experience"
A little girl called Lillie visited NVGC recently and did a drawing for us. One member enquired of Lillie why she had only put one kiss (X) under her name, she replied it was because she had only just met us!!!! Doctor Actually!!" Member now re-named Doctor Actually. during our January shut own, My Public cannot be expected to use it like this!!"